The BBVA Foundation has recognized composer John Adams with the BBVA Foundation Frontiers of Knowledge Award in the Music and Opera category. The jury’s citation underscores Adam’s tremendous communication skills and his determination to engage with the public. Although the North-American maestro’s works span every genre, it is in opera that he has come fully into his own. Garanti Bank has been supporting music for over 20 years now, uniting fans with internationally renowned artists. In addition to the Istanbul Jazz Festival, which will feature over 250 artists this July, the Turkish bank has also supported more than 1,500 concerts including big names like Travis, Nick Cave, Sting, Bjork, Marcus Miller, Joss Stone, Nouvelle Vague, Stacey Kent, Tony Allen, Madeleine Peyroux and Roger Waters. In the next few months, it will bring fans two more stars through its concert series: Courtney Barnett and Balthazar. The Museum of Fine Arts, Houston’s most recent Mixed Media event extended beyond its typical venue to include BBVA Compass Roof Garden, Brown Foundation, Inc. Plaza, and Cullen Sculpture Garden to celebrate the newly opened Glassell School of Art and outdoor public spaces. BBVA Compass Brand Ambassador Tyler Dial, graduating from the University of Texas on Friday, May 18, has released a graduation day single, “Truth in the Way,” to be followed by his full EP, Repaint, on May 25. The Walkman, MP3s, outdoor music festivals, intimate music venues, special meet & greet passes… Some ways to listen to music have endured, while others have evolved over time, and still others have disappeared. What is clear is that this art form has cemented its position online. It seems music triumphs in both hearts and web pages. Finnish composer Kaija Saariaho has been recognized with the BBVA Foundation’s Frontiers of Knowledge Award for “a contribution to contemporary music that is extraordinary in its individuality, breadth and scope,” as she has managed to seamlessly interweave the worlds of acoustic music and technology. BBVA enters the list of the world’s Top 25 banking brands published by The Banker (FT Group). The Frontiers of Knowledge Awards presented by the BBVA Foundation every year to recognize scientists and creators, who with their work, contribute to push the limits of human knowledge, and improve the lives of millions of people. Fans of both Boca Juniors and River Plate, Argentina´s premier soccer teams, can see the BBVA Francés logo on the jerseys of their favorite players. Music lovers, meanwhile, will find the bank sponsors tours by stars of yesterday and today, from Iron Maiden to Katy Perry. BBVA Compass has agreed to a multiyear agreement with the world’s leading sports and live entertainment company AEG to create opportunities for customers across the country, including events, concerts and brand activations at some of AEG’s key venues. The deal names BBVA Compass the exclusive banking partner across Fiddler’s Green Amphitheatre, Ogden Theatre (both in Denver, Colorado), and Verizon Theatre at Grand Prairie (Texas). The tenth month of the year is the most ‘summertumn’ of all. Check iWeather on a smartphone to see if it’s too cold to wakeboard. Use a laptop to find the best less-mainstream brunch spot in the Malasaña neighborhood. Having a hard time understanding? Maybe some millennial tips are needed to learn the slang. Tyler Dial is a rising country music artist who is always looking for ways to give back to his community – which is what also makes him a perfect fit as a BBVA Compass brand ambassador. Under 30, entrepreneurs and digital. This are the common traits that define the young Europeans chosen by Forbes magazine in its ’30 Under 30′ list. A mobile navigation aide for the visually impaired, a meal kit delivery platform, a t-shirt that allows users to peek inside the human body, a nightlife finder in London… Many tech-related projects that deserve special attention. Here we take a look at a few of them. The cell phone has become the perfect platform for enjoying practically any song, even in the most unexpected places. The only requirements are an internet connection and any one of the extensive array of apps now available. The traditional formats have been left behind. With the passage of time, music apps are gaining ground and their user numbers are increasing exponentially. 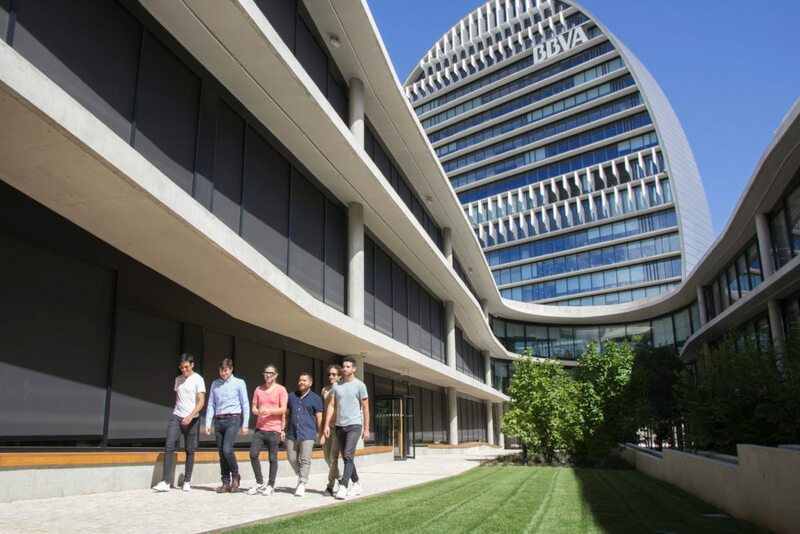 The BBVA app, recognized by Forrester Research as the best in the world, has helped strengthen digital adoption, since it offers the largest number of functionalities for carrying out transactions. How We Dream, the musical identity of BBVA, ha­­s undergone a major change from the time Michele Arnese and Ulrich Reese composed it, until it came to be sung by Maico. The adaptation of a DNA in sound form is not an easy process, but producer Manuel Colmenero was able to direct and adapt the tune and turn it into a great success. How We Dream, BBVA’s new song, already has a music video. Directed by Pilar Sanz, the video illustrates the song’s lyrics, capturing anonymous dreams inspired by ambition, perseverance and the happiness of pursuing and making our dreams come true. Computers already know how to paint, write poetry, compose music and come up with jokes without assistance. They aren’t able to break molds like the great masters, but machines can be creative, explains Ramón López de Mántaras in the book The Next Step. Exponential Life, which can be download for free on the website of BBVA’s OpenMind project. They say that islanders tend to be reserved, and take their time to open up. Miguel, Nito, Joan, Emilio and Ángel could all be said to fit the stereotype, except when they talk about music. They are Maico, the group tasked with singing BBVA’s sound identity, ‘How we dream’. A signature sound is much more than a song. It should tell a story that identifies it with the company’s values. That’s ‘How We Dream’ for BBVA – the sound track of opportunities – and Maico, the group that is the voice and soul of these opportunities. What is BBVA doing in a recording studio? Music, an indispensable connecting thread for telling stories. Excitement, a fundamental element when starting a new project. The responsibility for producing a job well done. These are the three pieces of a new puzzle that BBVA is putting together. Do you want to know more? What do dreams sound like? Fulfilling one’s dreams is a great goal and is something that is always present in everything BBVA does. So much so that “Adelante por los sueños que aún nos quedan (Onwards for the dreams that we still have)” is a line in the lyrics of the corporate tune that BBVA adopted 10 years ago and that it is now leaving behind to take a leap forward with his new sonic DNA How we dream, which have a common denominator: dreams. What does BBVA sound like? “It was not me who chose music, but music that expressed itself in me.” That is how composer Sofia Gubaidulina describes her relationship with music. Gubaidulina has just been announced as the recipient of BBVA Foundation’s Frontiers of Knowledge Award in contemporary music. On Tuesday, Jan. 31, BBVA Compass and national television personality and lifestyle expert Sandra Lee invited guests to celebrate the bank’s “51 Ways to #LiveBright in Houston” at the “BBVA Compass Big Game Headquarters” located at 5201 Green Tree Road in Tanglewood. The guest list for the cocktail reception included the people, places, and things affiliated with the “51 Ways” list along with local influencers. This weekend, BBVA Compass celebrated professional football’s biggest event in Houston, Texas and Birmingham, Ala., throwing super-sized celebrations that featured such celebrities as country music artist Jake Owen, NBA legend Robert Horry and lifestyle expert Sandra Lee. In 1939, composer Steve Reich was a boy taking a train from New York to Los Angeles to visit his divorced parents. Meanwhile, other children in Europe – Jews, just like him – were taking trains to Nazi extermination camps. Fifty years later, the contrast between his childhood memories and the horror of the Holocaust inspired Different Trains. Beatriz Caravaggio offers a video re-creation of the musical piece. From locating an unknown address to identifying the name of the song playing on the radio, apps can do almost anything. Although the app boom is over, users still download millions of them every day. This year, Snapchat was the most downloaded app in the Apple Store, according to Time magazine, followed by Messenger, Pokémon GO, Instagram and Facebook. Encouraging concert goers to turn on their smartphones during performances, filling London pubs with the music of Handel’s arias and sharing the stage with a rock band, are just some of the ways that some large symphony orchestras are exploring to attract younger audiences to concert halls. Summer is finally here! While many of us may picture ourselves jetting off to a tropical island to do nothing but enjoy cocktails while bathing in a secluded beach… the truth is that, unfortunately, due to a lack of money and time, some of us will have to save our dreams for later and spend the summer in the city. But, hey, it’s ok! There are thousands plans waiting for you – low-cost, even for free – and you probably didn’t know anything about them. Georges Aperghis was born in Athens into a family of artists in 1945, and has lived in Paris since settling there in 1963. His work is characterized by the drive to interrogate language, dissecting its meaning and its evolution, and by the merging of music and theater. In the Ezpeleta Este neighborhood, a mile or so from downtown Buenos Aires, Alejandro Pérez [BBVA Francés, Argentina] walks the streets to the sound of tango music. Making it here wasn’t easy. A new concept of branch office has been implemented in Peru, enabling thousands of customers to enjoy a completely different experience when carrying out their transactions at the branches. The initiative, called Radio BBVA, has not only created a pleasant and different atmosphere in the work space, but also contributes to enhance the quality of service and drive the dissemination of Peruvian music. Roberto Rostaing [BBVA Continental, Peru], knows that traditions are a platform on which we can prepare for the challenges of the future. Now we know something more about Garbiñe Muguruza’s tennis, after seeing fight all the way to the end against the world’s number 1, Serena Williams, in the Wimbledon 2015 final. OpenMind: "Reinventing the company in the digital age"
BBVA has published the sixth title in its OpenMind collection, which takes on the challenge of exploring and helping people understand the powerful forces that influence our world today.